There are some simple Group Policy Settings, which if appropriately configured, can make your network far safer than without them. 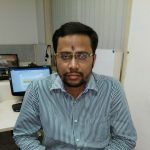 You can make your organizational network safer by configuring the security and operational behavior of computers through Group Policy (a group of settings in the computer registry). Through Group Policy, you can prevent users from accessing specific resources, run scripts, and perform simple tasks such as forcing a particular home page to open for every user in the network. In this article, you will learn about some important Group Policy settings that simply cannot be ignored. You must always remember to modify custom GPOs only, (create a new GPO and link it to the domain) available under “Domain Controllers” in the Group Policy Management Console. After applying the suggested changes, make your GPO applicable to “Everyone” in the domain and update the Group Policy Objects. In Group Policy Management Editor (opened for a user-created GPO), navigate to “User Configuration” “Administrative Templates” “Control Panel”. 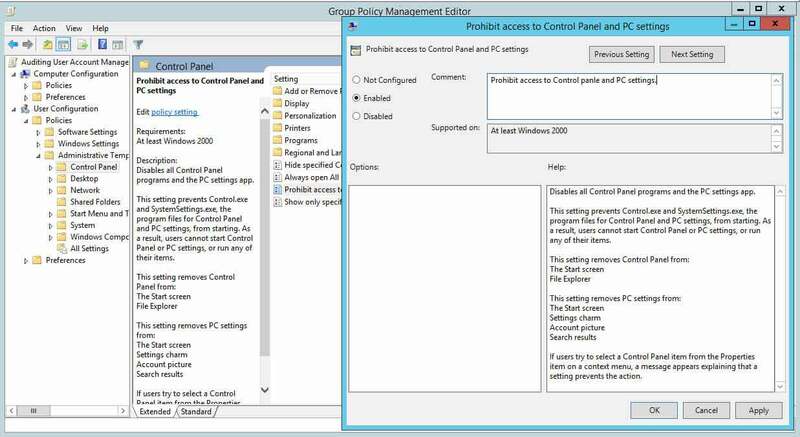 In the right pane, double-click “Prohibit access to Control Panel and PC settings” policy in to open its properties. Select “Enabled” from the three options. Windows generates and stores user account passwords in “hashes.” Windows generates both a LAN Manager hash (LM hash) and a Windows NT hash (NT hash) of passwords. It stores them in the local Security Accounts Manager (SAM) database or Active Directory. In Group Policy Management Editor window (opened for a custom GPO), go to “Computer Configuration” “Windows Settings” “Security Settings” “Local Policies” “Security Options”. In the right pane, double-click “Network security: Do not store LAN Manager hash value on next password change” policy. Select “Define this policy setting” checkbox and click “Enabled. 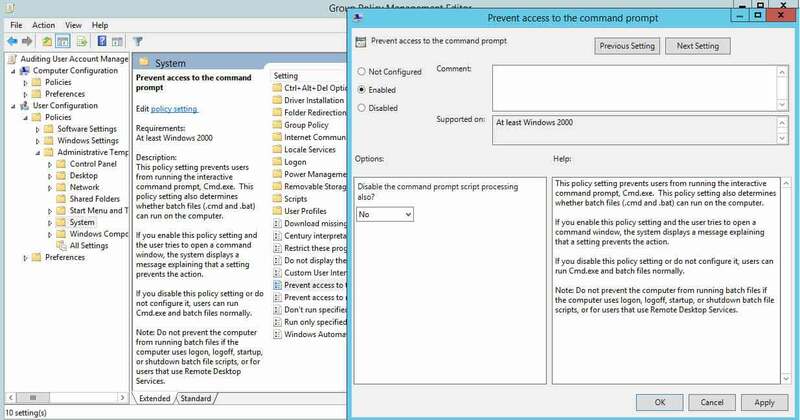 Command Prompts can be used to run commands that give high-level access to users and evade other restrictions on the system. So, to ensure system resources’ security, it’s wise to disable Command Prompt. In the window of Group Policy Management Editor (opened for a custom GPO), go to “User Configuration” “Windows Settings” “Policies” “Administrative Templates” “System”. In the right pane, double-click “Prevent access to the command prompt” policy. Click “Enabled” to apply the policy. Forced system restarts are common. For example, you may face a situation where you were working on your computer and Windows displays a message stating that your system needs to restart because of a security update. In “Group Policy Management Editor” window (opened for a custom GPO), go to “Computer Configuration” “Administrative Templates” “Windows Component” “Windows Update”. 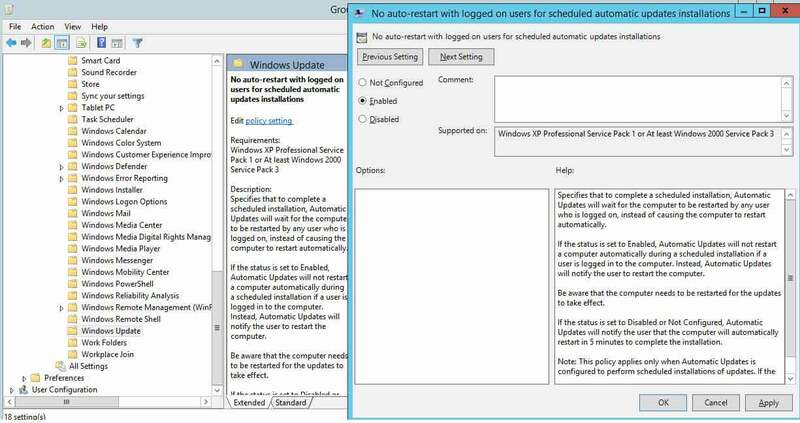 In the right pane, double-click “No auto-restart with logged on users for scheduled automatic updates installations” policy. Click “Enabled” to enable the policy. Removable media drives are very prone to infection, and they may also contain a virus or malware. If a user plugs an infected drive to a network computer, it can affect the entire network. Similarly, DVDs, CDs and Floppy Drives are prone to infection. 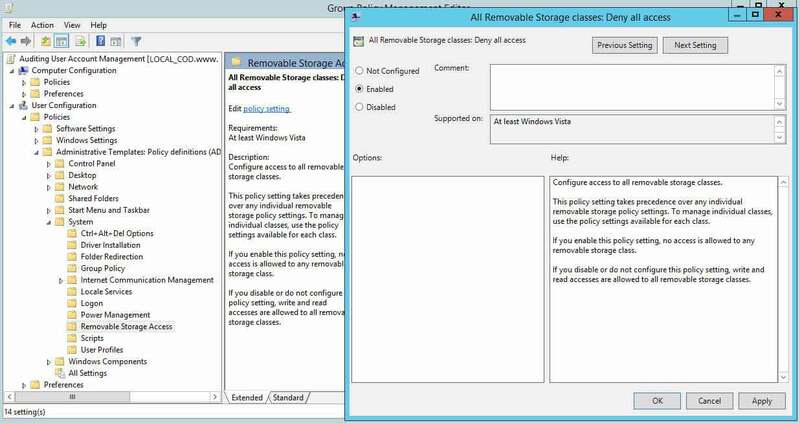 In Group Policy Management Editor window (opened for a custom GPO), go to “User Configuration” “Policies” “Administrative Templates” “System” “Removable Storage Access”. In Group Policy Management Editor (opened for a custom GPO), go to “Computer Configuration” “Administrative Templates” “Windows Component” “Windows Installer”. In the right pane, double-click “Prohibit User Install” policy. Through a Guest Account, users can get access to sensitive data. Such accounts grant access to a Windows computer and do not require a password. Enabling this account means anyone can misuse and abuse access to your systems. In Group Policy Management Editor (opened for a custom GPO), go to “Computer Configuration” “Windows Settings” “Security Settings” “Local Policies” “Security Options”. In the right pane, double-click “Accounts: Guest Account Status” policy. Select “Define this policy setting” checkbox and click “Disabled”. In Group Policy Management Editor window (opened for a custom GPO), go to “Computer Configuration” “Windows Settings” “Security Settings” “Account Policies” “Password Policy”. In the right pane, double-click “Minimum password length” policy, select “Define this policy setting” checkbox. Specify a value for the password length. If you set the password expiration age to a lengthy period of time, users will not have to change it very frequently, which means it’s more likely a password could get stolen. Shorter password expiration periods are always preferred. In the right pane, double-click “Maximum password age” policy. Select “Define this policy setting” checkbox and specify a value. In Group Policy Management Editor window, go to “Computer Configuration” “Policies” “Windows Settings” “Security Settings” “Local Policies” “Security Options”. In the right pane, double-click “Network Access: Do not allow anonymous enumeration of SAM accounts and shares” policy setting. Select “Define this policy setting” checkbox and click “Disable” to disable it. 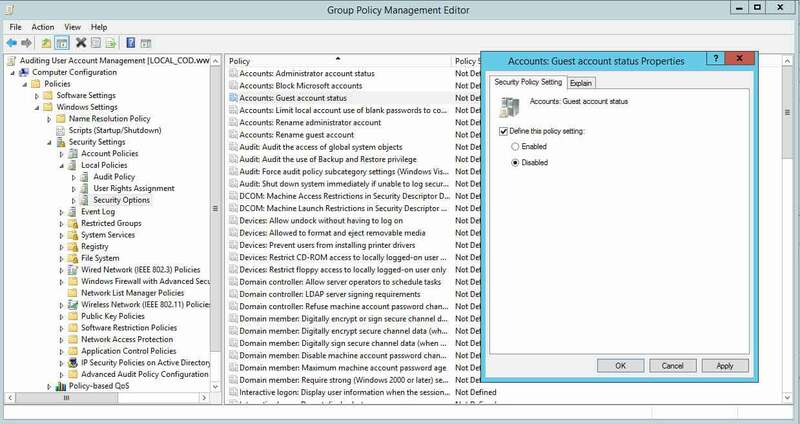 If you get these Group Policy settings correct, your organization’s security will automatically be in a better state. 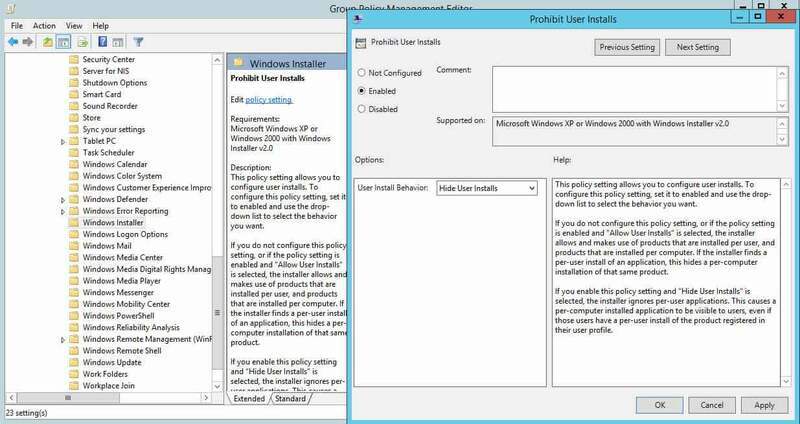 Please make sure to apply the modified Group Policy Object to everyone and update the Group Policies to reflect them on all domain controllers in your environment. 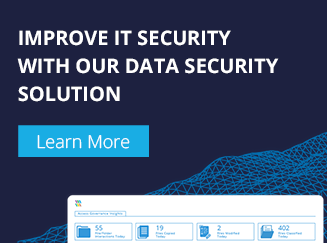 If you want to remain in full control your IT Infrastructure, you have to make sure no unwanted changes in these policies and other Group Policies are made. You can do this by performing continuous Group Policy Object auditing. However, doing through native auditing can be tricky, due to the amount of noise generated and the unavailability of predefined reports. To keep a continuous track of changes made in Group Policy Objects, download and install the free trial of LepideAuditor for Group Policy Objects. Our solution also allows you to reverse unwanted changes made in a GPO. You can download the free trial of LepideAuditor today to try it for yourself.